Sometimes simple landscapes make the grandest statement . . .
Winter in Black Forest, an oil pastel (5×7) was painted on cream-tinted Mi-Teintes pastel paper with Sennelier and Holbein brand oil pastels. Both a firm-tipped clay shaper and palette knife came in handy to work the trees and pond scene. I was drawn to the simplicity of the scene and was hoping the oil pastels provided the look I was after. Hope you enjoy your weekend ~ click onto the image for a larger view. The painting was inspired from a photograph taken by Elena an amazing artist and photographer with pmp. This entry was posted in About Oil Pastels, OPs New Paintings and tagged art, black forest, fine art, oil pastels, painting, pond, snow, trees, winter. Bookmark the permalink. I love this – so stark and peaceful. this is a beautiful, serene winter scene. Gorgeous. Thanks Carol!! Wondering how much snow you’ll see in NC – probably not nearly as much as up North. Mary, love the beauty and simplicity of this painting. You are right, it is a grand statement. Quite the opposite from our weekend trip to Scottsdale, AZ. 🙂 Have a great week! Thanks Janell, really appreciate it! You are so right – it’s a little too dry and sandy in AZ for me, but the days of bright blue skies are always gorgeous. This makes me think of an illustration in a children’s book… a fairytale, or something like Peter Rabbit. Neat Pauline, cool feedback – thanks very much! That is so very pretty. I think the lack of color lends to creating the perfect atmosphere! Very cool Elizabeth – I enjoyed your feedback on this piece. Thanks very much!! Hi Maniparna – thank you for enjoying the scene! I just love this, Mary! Thank you my friend, love hearing from you – you made my day. Hope you have a wonderful rest of the week – I’m sorry with being so late!! Your scenes are so *believable Mary … such a lovely quiet painting . Thank you Poppy, a beautiful comment and always appreciate how you view my work. Mary, this is such beautiful and amazing – let your week smile and shine for you! Thank you Mihrank for your lovely compliment – I really appreciate it! The simplicity is what makes it so beautiful…I love it!! This is so beautiful, Mary. I love the reflection…so calming. Thank you very much Jill – hope you are having a great weekend. Mary, I’m sure I have said this before about another of your paintings, but there’s something really different about this one. To me, it’s a beautiful expression of silence. Almost a sacred silence. So interesting Cynthia – I love your feedback and thoughts on this piece, very similar to Cynthia Jobin. A beautiful way to view the scene and a wonderful compliment. Thank you so much. Now I’ll have to go search for Cynthia Jobin’s comment! Beautifully delicate and spare…the oval, and the bent tree remind me of stylized Japanese art…the kind that is perfect for a zen meditation…. Thank you Cynthia for your quiet perspective on this painting, I can understand why you had this reaction – loved it. The scene has taken on a new perspective in my eyes. If you take a moment to read Cynthia Reves response to the painting (she came in right after you) you’ll read something very familiar about thoughts too. Hope you have a wonderful weekend. You are an artist Mary. Thank you Lis – have a lovely weekend! Lovely! I especially like how you did the reflection in the water. Thanks so much Nicodemas and for noticing the water!! Beautiful, Mary. I grew up near a few small ponds, brings those memories back. Thank you Geralyn, glad the piece brought back fond memories! Did you ever ice skate on them? Lovely! Brrr, you sure know how to portray the cold of winter. Thank you Resa! Have a wonderful weekend too! Love this, Mary! It is so nostalgic for me…quiet and serene….reminded me of my walks as a young child out in the countryside where I grew up…delicately beautiful! “Less is more” does apply perfectly to this piece. Framed by trees and small mounds of snow the pond has a mirror effect which reflects clarity and adds a focal point which is simply beautiful. Delightful winter treat! Hi Eva, thank you very much – loved reading your feedback and thoughts on the piece. It’s a winter scene that we don’t get to enjoy very often here in TX, so I had a lot of fun painting this quiet place. Have a great weekend too!! Really impressive, realistic. Did you do the header? My husband and I love water scenes. I wrote the Twitter article featured on Chris and Jean’s site. I wanted to come over and introduce myself and thank you for clicking the like button. Thank you very much Janice – very nice to meet you. Yes, the Header was a painting I did several years ago – thanks for noticing it. Have a wonderful weekend. Only your painting can deliver the beauty and simplicity of the scene. Truly beautiful, Mary! Thank you Amy – really enjoyed your beautiful and thoughtful words on this piece. 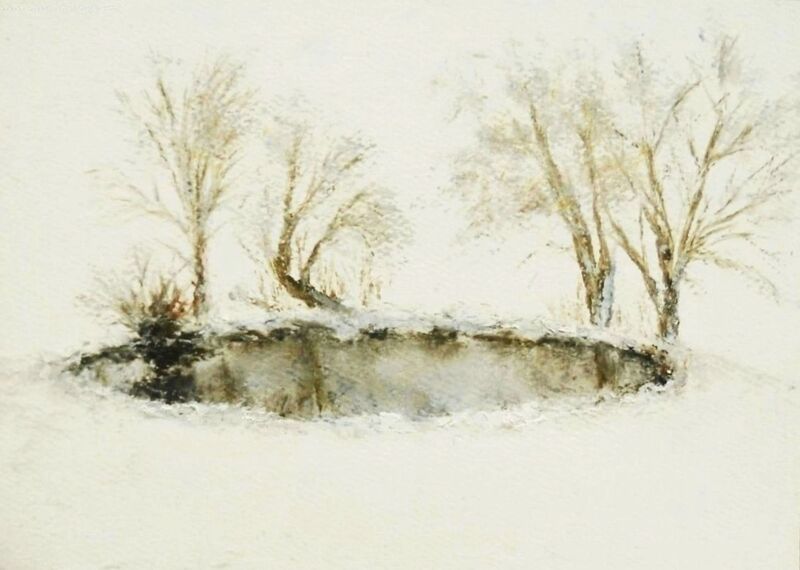 Thank you Rhonda – it was a fun scene to develop, especially the trees and little mounds of snow circling the pond. Thank you Rebecca! BTW your work is incredible – loved the fresh linen piece! Hi Mary. Thank you – it’s really lovely to get feedback as I’ve only been painting for 18 months. To piece you mention has just been in an exhibition and spotted by a local gallery who is now interested in my work. So fingers crossed! An amazing story, this is what dreams are made of. Very exciting and happy for you – your paintings show incredible talent. Thank you. I very much enjoy your blog artistic talents too. Thanks so much!! I made a mistake with her name, it’s Elena or “Dracaena” as her pen name on pmp. Brrr, it feels cold. I agree, sometimes simplicity is the boldest statement. Very very nice, I like the reflection in the little pond. Thanks so much Joanna – I really appreciate your thoughtful feedback on the piece. “Simple” always provides opportunity for focus and clarity. This is perfect, Mary. Thank you Audrey – what a beautiful to write. I really appreciate it – have a great weekend! Thank you Sarah – have a beautiful weekend. Hi Janet, thank you! You practice the art of less is more so often in your art, I could study your pieces for a very long time and continue to be mesmerized by your works. Wonderful winter colors, love it! So delicate! I love it 🙂 Happy weekend to you, Mary. Thank you Jo and happy weekend to you – I need to pop over and see where your “six-word” takes us this Saturday! Don’t have one this weekend Mary. Am at my son’s en route for the Algarve. Just saw that ~ have a wonderful time!